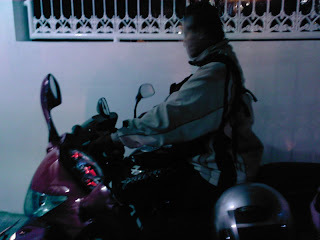 I don’t know exactly when I tested this motorcycle, may be at end year 2007; quite long indeed. This motorcycle is owned by my brother. He pick this motorcycle because this is the best motorcycle based on his criteria. 3. Best value for his money compared to the others brand that has lower capacity engine. Based on those criteria, he was chose this motorcycle (the back one)..
Ok, I don’t want to discuss much further about this. Let me test this motorcycle performance. Pulsar 180 Dts-i handling is very good, its stability and accurate handling is just the answer if you like a touring bike. If we look on the wheel based then you will know that this bike is design for stability not for a fast cornering. But with a right handling skill, it shouldn’t be any problem. The thank is big enough (15L), but the design is not good. It should be bigger near my leg, so my leg is more comfort. Front shock absorber is soft and the rear too soft, I should adjust it based on my criteria. I test it on a medium ‘till high RPM on the cornering; the bike is very good, I can push the bike until I touch the curb and get out as fast as I can. But there is something that bugs me; the tire grip isn’t good enough on cornering. I should be more careful on this tire performance. Riding position on Pulsar is like a semi sport touring bike with a medium steering (not too low and not too high). Pulsar is offer enjoy of city ride. I can not sit on the seat a little backward, because it’s not comfort on there, I should sit forward near the thank. That’s the most comfort riding position. The seat foam is thin, I can not sit a little bit longer with it. Turn the engine on, and I’m ready to roll. Shifting to gear one and open the throttle. Engine power distributing to the rear wheel is very smooth, and I think this 180cc engine torque shouldn’t be like this, it should serving me with more torque on first acceleration. I almost forget, shifting to the gear one from the second gear is a little bit difficult if I compared to the other gear. Front and rear braking system is good; I don’t need more effort to stop this motorcycle while I’m on fast mode. The bike stop just as I want. That is my test result on Pulsar 180. I know this is quite late, because I’m kinda busy to start writing these days. Oh, the pulsar engine vibration is increased on medium RPM, it seem that Bajaj should fix this a soon as possible because it disturbing me. I always using medium until high RPM, and I can feel it on the seat. But I think the vibration is not as high as Japanese brand. Rubber steering is hurting my palm, the rubber design is like a 0.5mm needle on its surfaces; should wearing my glove. bro, bisa diakalin gan? 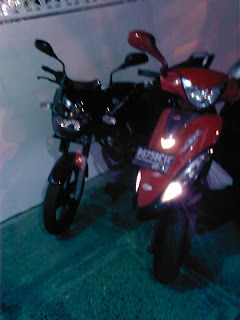 pasang spion pulsar ke trend?